On our first trip down to St. Louis, I packed little, glazed ham and cheese sandwiches for the road. I’d never heard of funeral sandwiches or this type of small, glazed sandwich until I saw them appear in my social media feeds this year. When I posted a photo of my second batch, friends and readers commented that they make them often and see them at social gatherings. Jake and I shook our head and wondered how we’d never encountered these sandwiches before. As far as I can gather, the name “funeral sandwiches,” refers to the fact that they are often served at funerals. Most funeral sandwich recipes consist of Hawaiian buns that are filled with ham and swiss, drizzled with a marinade of butter, Worcestershire, mustard, brown sugar, and onion powder, and baked. Some recipes call for a sprinkle of poppy seeds and many suggest you marinade the sandwiches anywhere from overnight to a few hours before baking. My version is quick. Simply drizzle and bake. The sandwiches taste best fresh out of the oven, but we don’t mind eating them cold, too. The glaze makes the outside of the sandwiches sticky, so pack some napkins if you take them on a road trip or picnic. I found Hawaiian rolls on sale, but use whatever small bun you’d like. The same goes for your meat and cheese filling. Most recipes call for ham and swiss. I used whatever cheese was already in my fridge. We liked the “Hawaiian” ham I found at Target’s deli counter. Not sure what makes it Hawaiian, except it tastes a little bit sweeter. We also made these sandwiches with sliced chicken. Go nuts! 2 good squirts of Dijon mustard (ALDI sells a nice, punchy one). 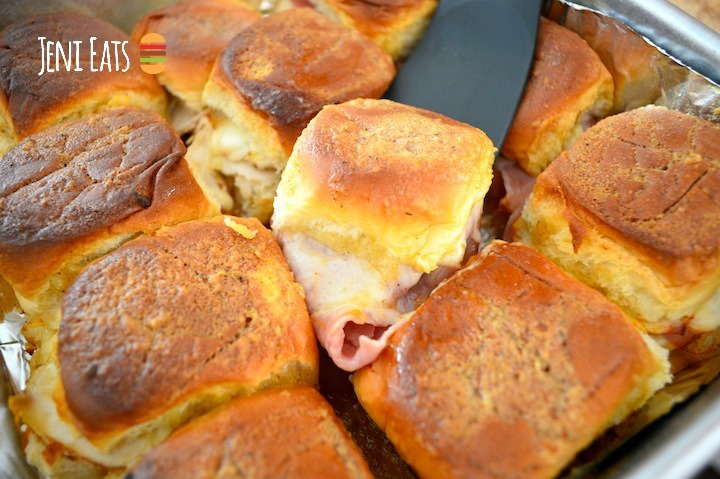 Slice rolls and fill with sliced ham and cheese. Place rolls in a lightly greased pan or baking dish or line with foil or parchment. In a small bowl, whisk together the melted butter, mustard, Dijon, honey, Worcestershire, grated onion, black pepper, and salt. Taste for seasoning and adjust if needed. Drizzle the sauce over the rolls. Bake at 350°F or until the sauce absorbs into the buns and the tops are golden brown. This should take about 20 minutes. I’d never heard of these either- but they really sound good! I love those Hawaiian rolls- they are addicting. This makes me want to pack a picnic lunch and go fishing or just wander outside in a big park. We actually serve these at funerals sometimes. Our church individually wraps each bun in tin foil. It works nicely because you can bake a lot of sandwiches in the oven that way, and then people can kind of keep the mess of the sandwich in the tin foil pouch, creating an easier clean up job for everyone on dish duty. In the South we use brown sugar instead of honey. I’ve made a variation using meatballs. I add garlic powder to sauce. I’ve even made them on italian bread. Thanks for sharing your tips! The meatballs sound delicious. I ended up with half a deli tray full of random cold cuts and random cheese after an event yesterday. Time to “go nuts” with funeral sandwiches! Thanks for the recipe. Great idea. I love that you can use any meats for these sandwiches.